Winter wallop: Just before this weekend, I was jealously viewing photos of sunny Greek island beach and village scenes that local residents and business operators had been sharing on social media. Weather reports showing temperatures in the mid to high teens (Celsius) made me even more envious. Until today. When I logged into my blog’s Facebook page this afternoon, the photos and posts in my news feed were telling a completely different story — severe winds and heavy rain were lashing many of the Aegean islands as a ferocious winter storm surged across Greece. Despite the gale-force winds, some hardy residents of Agathonisi, Samos and Rhodes ventured outdoors to capture dramatic photos of waves and stormy skies at their respective islands. On Mykonos, a local restaurant owner stayed inside his vehicle to shoot photos of flooded roads, wave debris on the Ornos bay seafront, and boats that had been ripped from their moorings and tossed ashore. 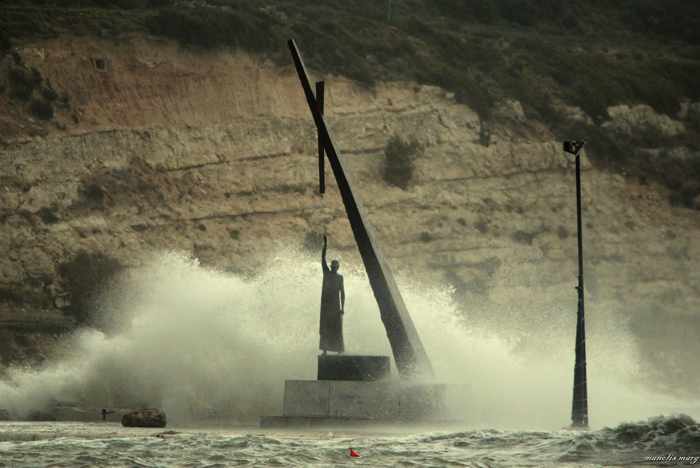 The winds were so strong– exceeding force 8 and 9 on the Beaufort scale — that they prevented flights by Aegean Airlines and Ryanair from landing on Rhodes, the Greek news website The Rodiaki reported. Rough seas forced the cancellation of shipping and ferry services to many islands as well. And this was just the beginning of even worse weather expected nationwide for the next several days. In a separate report, The Rodiaki said many parts of Greece can expect cold to freezing temperatures by Monday, along with continuing strong winds, while some regions of the mainland can expect snowfalls. Coincidentally, it’s almost exactly one year ago that brutal winter weather struck Greece, dumping snow on some of the Cyclades islands (see my Snow scenes from the Cyclades post for winter storm photos from islands including Andros, Tinos, Naxos, Milos and Paros). But, as always, the islanders aren’t letting bad weather get them down. On its Facebook page, Super Paradise beach observed: “No winter lasts forever. Mykonos awaits.” And the Mykonos Palace Hotel posted this quote from W.R. Alger: “After every ‪‎storm‬ the ‪‎sun‬ will smile; for every problem there is a solution, and the soul’s indefeasible duty is to be of good cheer.” Good points indeed — there’s only 154 more days until summer! Please click here or on the link beneath the next picture to turn to page 2 of this post, where you can view storm photos from Samos, Mykonos, Agathonisi and Rhodes. 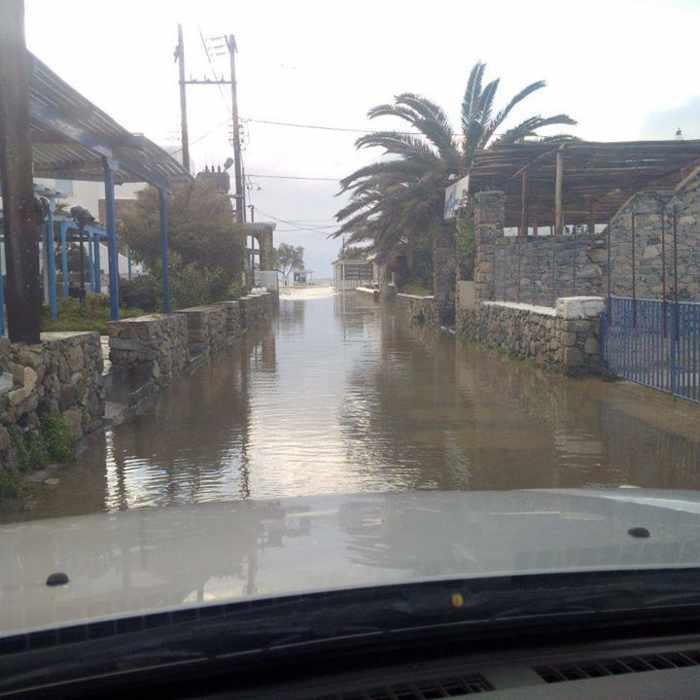 A flooded road in the Ornos beach area of Mykonos is seen in this photograph shot by Sikiniotis Lefteris, who owns the Apaggio restaurant at Ornos. Several more of his photos, showing wave damage on the Ornos bay seashore, can be seen on page 2 of this post. 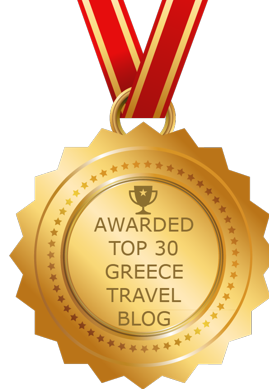 Greeking.me — Visit Greece like a local!